What is a Filter Tester? The MicroPure Filter Tester was developed to provide a quick "go, no-go" aerosol test for determining filter cartridge integrity. Its compact size makes it portable and easy to handle at virtually any plant site. To ensure your filter cartridges are intact and are providing the necessary sterile filtration your application requires. The MicroPure Filter Tester provides an enhanced visual test that will show cartridge degradation far better than any simple visual inspection. By providing a better method of monitoring filter cartridge integrity and performance, this filter tester will help ensure the quality and safety of your product. The MicroPure Filter Tester is designed to accept a wide variety of filter cartridges, including all MicroPure Segmented Filters and other manufacturers' cartridges through the use of adaptors. The cartridge to be tested is inserted into the top opening and secured. 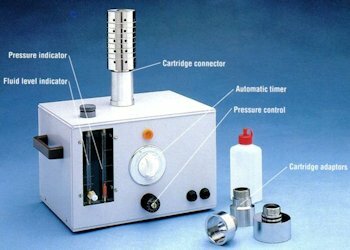 A timer is then activated which causes the Tester to heat non-toxic paraffin which generates an aerosol smoke. Aerosol particle size range is 2 to 10 microns. The aerosol is applied under pressure to the center of the cartridge being tested. An automatic timer allows the user to establish the proper amount of time to rest each cartridge. The aerosol quickly penetrates even the smallest leak in the filter, providing immediate visual confirmation. If no aerosol appears, the cartridge is intact and can be sterilized and put back into service. Depending on the size of the cartridge, testing can be successfully completed in one to two minutes. The test does not require a trained technician; plant personnel responsible for the filter can successfully use the Filter Tester with a high level of confidence.